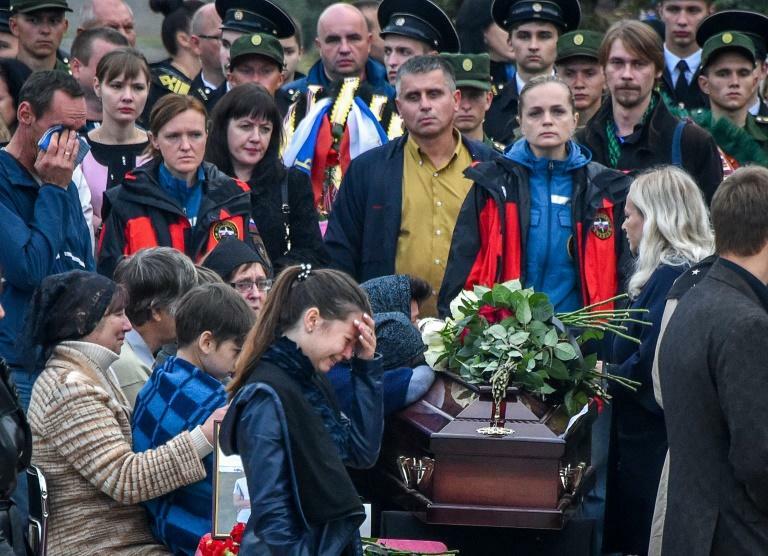 Students wept over the coffins of classmates Friday at the funeral of 20 people killed in a school shooting in Crimea dubbed the "Russian Columbine", the worst massacre of its kind in the region's history. Eighteen-year-old Vladislav Roslyakov opened fire on Wednesday at the technical college in the city of Kerch before killing himself. More than 40 others were injured in the attack. 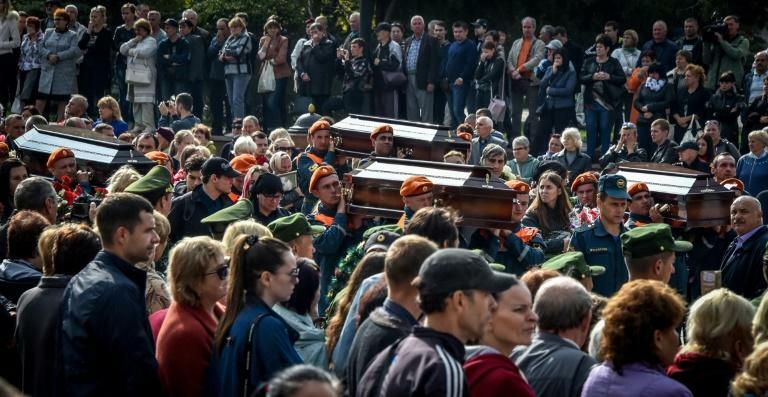 "We don't want to talk, we want to weep," the leader of the Moscow-annexed peninsula Sergei Aksyonov told a crowd of hundreds at Kerch's central square, where mourners laid flowers on the coffins. "The history of Crimea will be divided in two -- before and after October 17," he said. "We need to be strong, we need to be brave." On the city's Lenin Square, tables covered in red cloth had been set up opposite a statue of the Soviet leader, each one bearing a photograph of a victim. 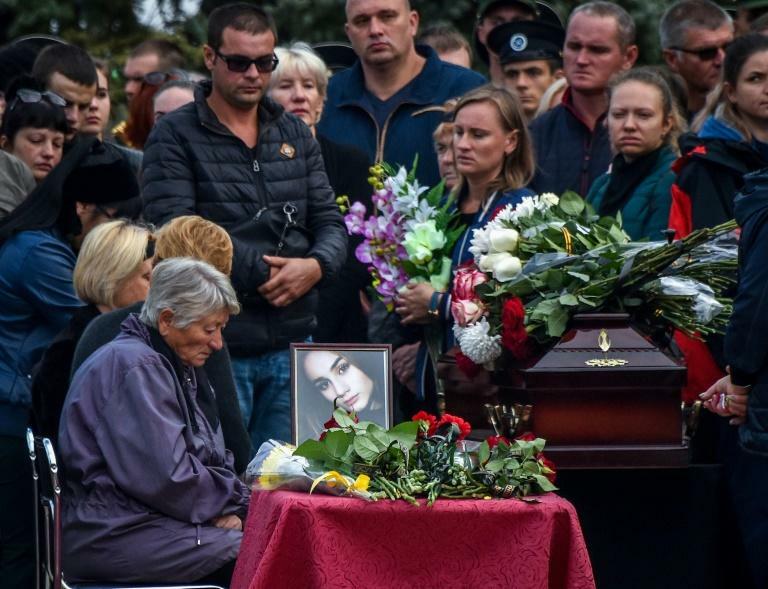 Aksyonov placed a red rose in front of each coffin at the ceremony, which then continued in a procession to the city's new cemetery. Hundreds of students from the technical college where the attack took place were at the square, including an injured young woman in a wheelchair. Security had been stepped up in the city of 150,000 in the far east of Crimea, where a recently-opened bridge links the Russian mainland to the annexed territory. All central roads have been closed. Of those injured in the attack, a number remained in a "very serious condition", Russian health minister Veronika Skvortsova said. Nine have been transferred to Moscow for further treatment, Crimean health minister Alexander Golenko said. Many of those hospitalised were injured by an explosion that blasted metal ball bearings and other items into their bodies. Photographs published online showed carnage inside the school following the attack, with glass doors and windows shattered, desks scattered and debris strewn across the floor. "Kerch will not remain what it was before, that's for sure. There's still fear, all the children feel it," Oleg Zhmaka, the director of a sports school, told AFP in the centre of the city following the ceremony. Along with many other local residents, he questioned whether Roslyakov, also a student at the college, could have acted alone. "I think they're hiding something from us: it's hard to believe that this boy could have organised it all alone." But another resident, Natalya Odegova, said she doubted there were any outside forces involved. "This is because something happened in the head of a young man," she said. On Thursday, a girl claiming to be Roslyakov's ex-girlfriend told Russian media he had spoken of taking revenge for bullying. "He would say that he lost trust in people when his classmates began humiliating him for not being like everyone else," a 15-year-old named as Zlata told the Kremlin-funded RT television outlet. President Vladimir Putin said the killing was the "result of globalisation" and the continuation of a trend that had begun in the US. Investigators are working to establish the teenager's exact motive and whether he was working alone. According to the Russian Kommersant newspaper, the teenager "grew up in a rather poor family" with a disabled father. The paper said Roslyakov's mother is a Jehovah's Witness -- a Christian organisation considered "extremist" and banned in Russia. Russian television reported that she works as an orderly at one of the hospitals that treated victims.